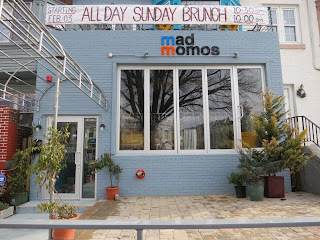 Mad Momos is a new American and Himalayan restaurant located in the Columbia Heights neighborhood of DC. It opened in December of 2012 and was of particular interest to me because they were advertising vegan options for every meal including brunch -- a meal that is hard to find vegan. So, me and my friend headed over for their very first brunch. The restaurant is located at 14th and Spring Road in Mt. Pleasant, quite a ways away from DC USA, the heart of Columbia Heights. That said, it is not in a bustling area in town so it was easy to find parking right in front of the restaurant. From the outside, it looks like a new cafe, painted in baby blue with large floor-to-ceiling windows. We arrived around 11:30 a.m. on a Sunday and there were only a few occupied tables. We had our choice of downstairs or upstairs and we chose to go upstairs. 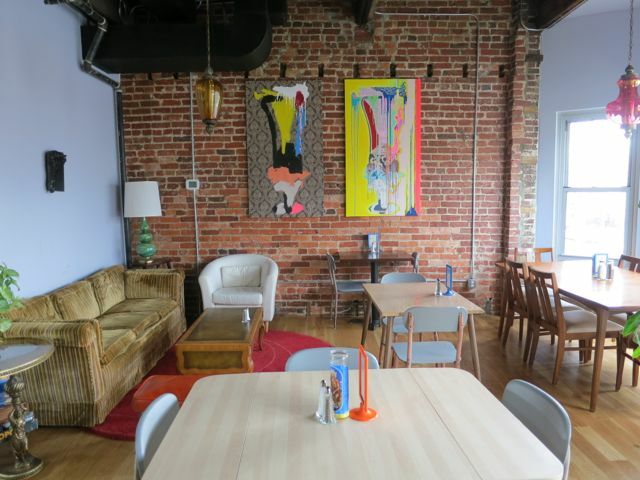 The upstairs is very eclectic with its exposed brick walls, colorful artwork, and a seemingly random set of tables, chairs, armchairs, and sofas. Under the table by the couch, was a set of board games presumably for use by the patrons. 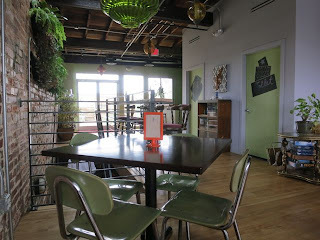 There was also an outside patio that looks like it would be a wonderful spot once the weather warms up. 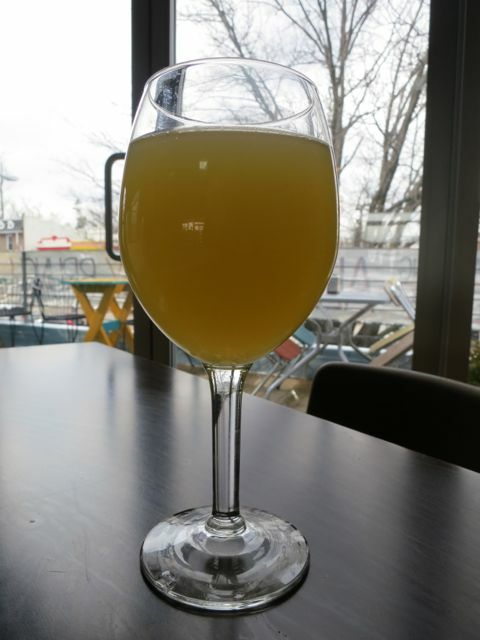 We each started with mimosas, opting for just one rather than the bottomless mimosa deal for $15. It was a bit early to consider getting lit for the rest of the day. We ordered an appetizer -- the crispy vegan rock and roll. We asked the waiter what that was and he wasn't really sure as there was no description on the menu. 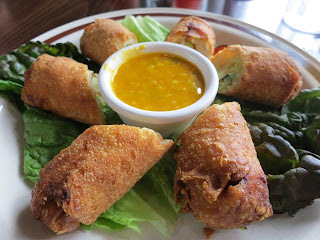 Come to find out, it is basically vegan egg rolls filled with cabbage and served with a mango and black bean sauce. We enjoyed this dish and found the sauce to be delightfully unusual. In case you are wondering where the name came from, momos are tasty dumplings native to the Himalayan region. At Mad Momos, they make all of their momos on site with creative fillings and sauces. The owner, Topden, is originally from Sikkim, a part of India in the Himalayas. 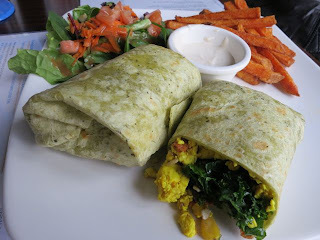 Despite being intrigued by the momos, I decided to order the scrambled tofu mad wrap instead while my friend got the momos. I have to admit that my expectations are usually pretty low when I order a tofu wrap as many restaurants make them so that they have no flavor whatsoever. Boy, was I surprised with this one. This huge wrap came loaded with scrambled tofu, curly kale, sunflower seeds, and "momo crisps." The tofu had been seasoned just right so that when paired with the kale, seasoned sunflower seeds, and fried crisps, it was absolutely delicious. It was served with a nice, fresh salad with balsamic vinaigrette along with sweet potato fries. Beware of the creamy sauce that comes with the fries though as the one I was served was not vegan. I'm glad I was suspicious enough to ask. Perhaps in the near future, they'll make it vegan. For now, I just requested ketchup and hot sauce. Hey, they are a new restaurant so I'm sure they'll iron these things out. Just be sure to ask if you are suspicious about anything. So, all in all, with an $8 appetizer and $9.50 brunch platter, I thought it was a great value for the money. 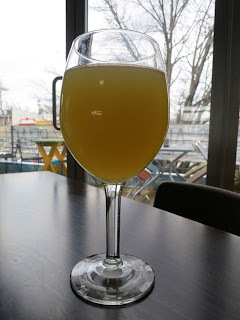 The food was fresh and delicious, the service was good, and the restaurant had a fun vibe. I bet it gets a lot more popular over the coming months. Thanks for the review! Sounds like a great spot. Can't wait to check it out!